Evidently, Ricky Gervais has never heard the infamous Lionel Richie song that goes, "Once, twice, three times a lady," because he couldn't settle for hosting the Golden Globes just three times. On Sunday, Jan. 10, 2016, Gervais will host the Golden Globes for a fourth time and potentially piss off many celebrities in the process. So make sure you've got your fridge filled with plenty of libations, because it's going to be a fun night. I was a big fan of the dynamic duo of Amy Poehler and Tina Fey as hosts of the booziest awards show out there, but I think the pair lost steam in their 2015 outing. The only joke that truly shocked and impressed me was their arguably awkward Bill Cosby joke that made me laugh out loud, while simultaneously wonder what the hell they were doing. Other than that, I found the hosts weren't involved in the 2015 show enough given how well they'd done previously, which led me to be surprisingly excited to hear that Gervais was giving it another go. The creator and star of The Office, Extras, and Derek hosted the Hollywood Foreign Press Association's (HFPA) awards show in 2010, 2011, and 2012, but he's still a somewhat controversial choice for the Globes since he has been accused of being too cruel to the celebrities in (and not in) attendance. On TODAY with Matt Lauer, Gervais said about his fourth go at hosting, "I'm never trying to undermine the moral fabric of America. I'd rather people laugh than gasp. But if they gasp that's good too." I have a truly unhealthy love of actors and I still really appreciate Gervais' droll barbs targeted at celebrities. I know celebs are people too, but they are public figures at a swanky awards show getting honored for their work — they should be able to handle a few jabs from Gervais. But this controversy may be the exact reason that Gervais has been brought back for a fourth year. TV Guide interviewed James F. English, a University of Pennsylvania professor who wrote the book The Economy of Prestige, about Gervais' "scandalous" hosting past and how it's beneficial for the Globes' ratings. "That seemingly disruptive, outrageous, ill-mannered behavior... people say, 'Oh that was so awful!' but you get this story repeated," English said. "You have discussions about values, and what's appropriate. That's good for the Globes. If you can get buzz with some scandal and outrage, you get people watching." 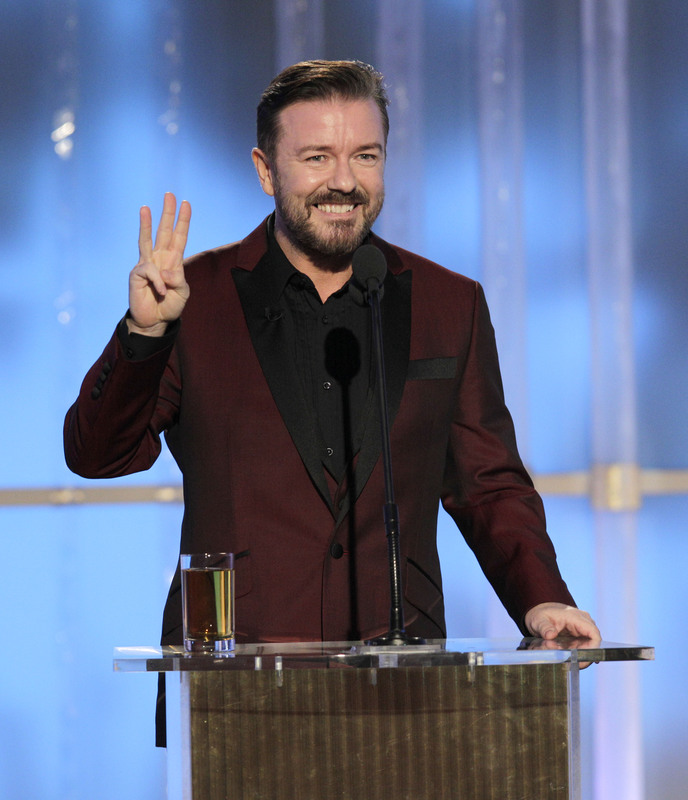 If you are one of the viewers who was previously offended by Gervais the three previous times he hosted, don't expect the 2016 Golden Globes to be any different. He "apologized" on Twitter on Jan. 1 for his future behavior, writing "Because I can see the future, I'd like to apologise now for the things I said at next week's Golden Globes. I was drunk & didn't give a f*ck." Alas, the Brit is back to make fun of Hollywood for the fourth time — and I'll be cheering him on from the couch.